Last week we posted statistics on the databases that Java developers choose for their deployments in Jelastic PaaS. Now, it’s time for the market share charts for open-source Java application servers. Jelastic is in a good position to publish the stats. 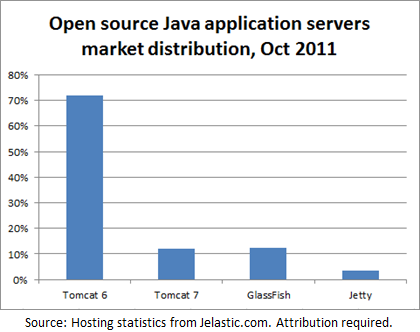 The platform already has more that 2,000 environments created (so a good sample of data), and Java developers are not constrained to specific proprietary container but can choose the server that they want to use currently from Tomcat 6 or 7, GlassFish and Jetty. Whatever developers select – Jelastic runs for them. 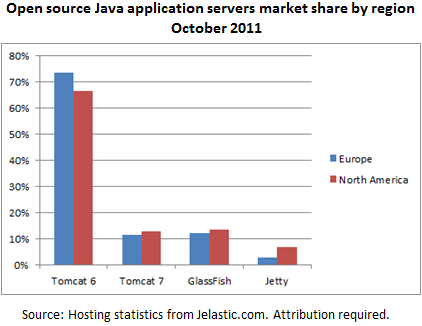 So Tomcat 6 is still by far the number one choice, but GlassFish is picking up and already ahead of Tomcat 7. It is interesting to see that Jetty is way more popular in the US than in Europe. However, one thing to keep in mind when comparing the regions is that European deployment is actually older – Jelastic launched there back in July 2011, and US launch was only 3 weeks ago. Thus it might be that US data simply shows the dynamic on the market and Jetty is growing fast now. We will be posting updates on a monthly basis – so in a month we will see how the market distribution for Tomcat 6 and 7, GlassFish and Jetty is changing over time. Stay tuned to see the updated numbers next month!